Before the Galaxy S4 announcement from Samsung, Apple took aim at Android/Google as a whole and Samsung itself, but they are back at it even more blatantly than before. Apple has put up a webpage specifically detailing why their iPhone is still better than every other phone on the market. Sure, Apple makes a point of letting people know about the 8 J.D. Power and Associates awards they have received for the iPhone, but does that really make them the best? It seems a little insane to say the iPhone is better than every other phone on the market, and when it comes down to it, there is literally no phone that is best for everybody. 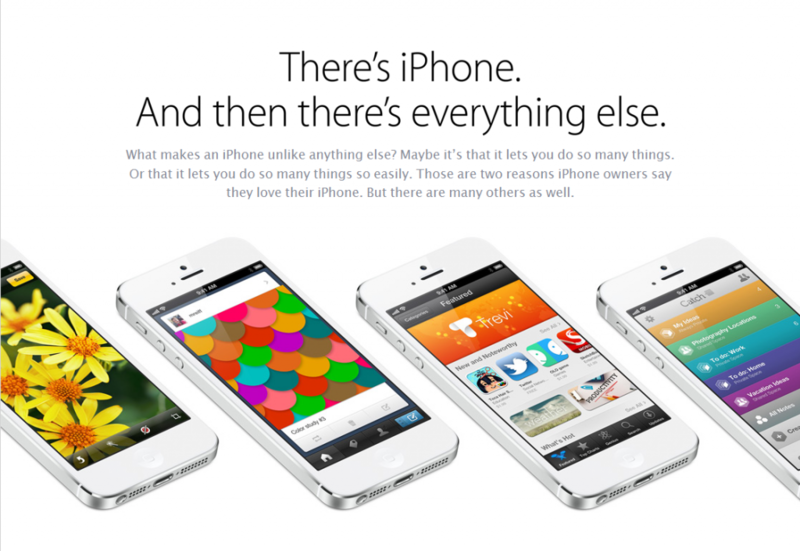 The webpage that Apple has released reads “There’s iPhone. And then there’s everything else.” basically saying that despite attempts from their competitors, you simply cannot beat Apple and their amazing iPhone. Well, I have no problem giving Apple the title of “first to do it” with things like Retina Display and Siri. However, in reality other devices have either outdone Apple or are coming close to doing so. The iPhone does indeed have an amazing screen resolution, but when comparing it to other current phones, the average person does not see a big enough difference in resolution that Retina Display is a selling point. Tons of phones have LTE and therefore it is not some amazing Apple-exclusive feature. Using Siri in their “campaign” against all other phones does not make a lot of sense since the latest versions of Google Voice Search win against Siri during many occasions. Choosing to put up a webpage saying how “great” the iPhone is, just shows that Apple is likely nervous about losing ground to Android devices especially with all the hype following the Galaxy S4 event.